The Acting Minister of Defense of Afghanistan Asadullah Khalid met with his U.S. 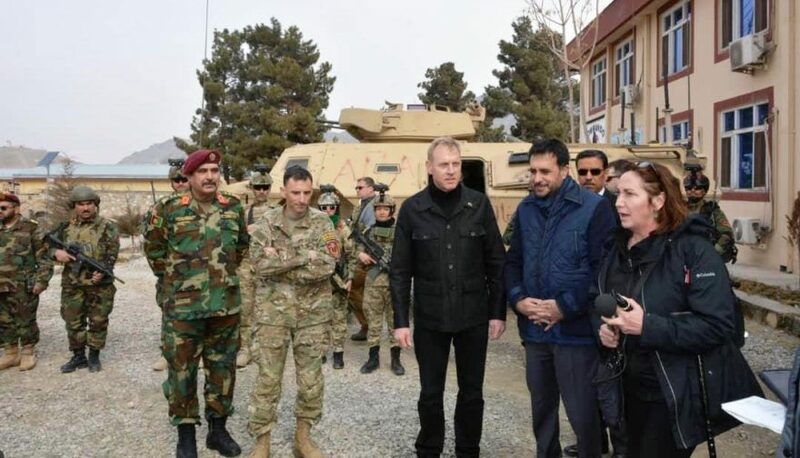 Counterpart Patrick Shanahan in Kabul, the Ministry of Defense (MoD) said. According to a statement related by the Ministry of Defense, the meeting was held in the Special Operations Corps Headquarters this morning in which the two sides held comprehensive talks regarding security and defense related issues. The statment further added that the Acting Minister of Defense of Afghanistan Asadullah Khalid pointed towards the recent achievements of the Afghan Army and hailed the United States for the all-out support to the Afghan National Defense and Security Forces. He also urged Mr. Patrick to further expand cooperation with the Afghan forces in the fields of training and equipping of the armed forces of Afghanistan. In his turn, Mr. Patrick reaffirmed U.S. support to the Afghan forces specifically to Afghan army and promised that the United States remains committed to support Afghanistan with the training and equipping of the Afghan forces and in the fight against terrorism. The Acting U.S. Secretary of Defense arrived in Afghanistan in an unannounced visit earlier today.